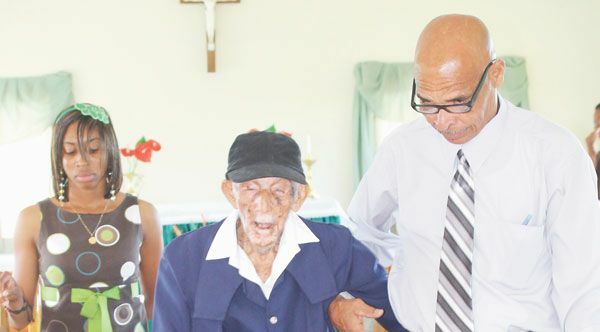 This year, the church, along with family members and friends, once again showed their love and admiration, as Beach, affectionately known to all as âDaddy Palâ, celebrated his 107th birthday with a special church service, four days before the occasion. Well wishers from various parishes gathered at the Church of Transfiguration, Lowmans Leeward, for the thanksgiving service, led by Dean Patrick McIntosh in honour of Beach, who had been a server in the Anglican Church for most of his life. Dean McIntosh called on Christian members of the congregation to follow the example of Beach, whose actions throughout his life have reflected his faith in Christ. Beach, who was born on February 9, 1905, has lived and served in almost every area in St. Vincent and the Grenadines, including Bequia, Kingstown, Calder, Georgetown and Greggs, where he finally settled down with his wife Jennetta, whom he married in 1944. The couple had seven children; one has since died. Jennetta passed away fifteen years ago. When he was more active, Daddy Pal worked as a carpenter, magician, mason and basket weaver. The grandfather and great grandfather of many told SEARCHLIGHT that he is happy to still be around, and reaffirmed the point made last year on his birthday, that family is most important to him. âMy wish right now is to see my children stay in the way of the Lord,â he noted. The ever active Beach, whose memory is still sharp, on Sunday, shared jokes and recollections with the many persons who came to the celebratory service to pay homage to him; including Bishop of the Windward Islands The Very Reverend Leopold Friday. His daughter, Verna Shallow, with whom he resides, told SEARCHLIGHT in an interview last year that her father does almost everything for himself and is full of life.